I get asked by students all the time about how to practice exercises and patterns. Here’s a quick overview of the process with a video to help guide you along the way. In this post and video I’m going to explain how to practice the pentatonic patterns that can be found in my ebook, Pentatonic Patterns for Improvisation. The material comes from the Pentatonic Patterns Sample that anyone can download for free by clicking this link. This sample ebook is a great place to get started. It contains the preparatory exercises from the full version as well as a few patterns to get you going. You can also download the backing track used in the video from this same link. All of this stuff is taken directly from the full version of the Pentatonic Patterns for Improvisation ebook, which includes over 60 great pentatonic scale patterns and 12 backing tracks for all the keys. In the video, I’ll be playing along with the G minor/Bb major backing track (which can be downloaded by anyone for free here.) Alternatively, you could watch this YouTube video of the backing track. If you don’t yet have these downloads, click on the link and get them now. I’ll wait. Step 1. Read through the book. This might sound obvious, but I know it’s natural to want to jump straight to the patterns and skip all the boring text. I’ve done this myself with just about every music book I’ve ever bought. With this in mind, I’ve tried to keep my explanations very concise and clear, so it will only take you a couple of minutes. If you find yourself confused while working through the book, go back and read through the text again. Sometimes it takes a little while for it all to sink in. If you play alto you’re going to be playing your G Major/E minor pentatonic scale. All 12 of the major pentatonic scales are provided in the pdf along with their relative minor partner. Learn the 5 notes of the scale and memorize them. This should take all of 30 seconds. Don’t look at the notes written down again from this point forward. Work through the scale up and down at your own speed until you are comfortable. When you can play this smoothly, with no wrong notes, and in sync with the metronome. increase the tempo by 2-5 bpm. Repeat this process until you can play the exercise at 80 bpm with no wrong notes and in sync with the metronome. Now you can play along with the backing track which is also at 80 bpm. Repeat this same process for the second preparatory exercise. This time I’m going to show you what this would sound like once you’re able to play the exercise in 8th notes at 80 bpm. I highly recommend learning to play Pentatonic Exercise 1 and 2 in all 12 keys. It may take you a bit of time, but it is time very well spent. Your playing will be transformed once you do this. Step 4. Now you’re ready to start working on the patterns. I’ll now play pattern 1.2 over the backing track in 8th notes. If you practice slowly and accurately at first while gradually increasing the tempo, you can arrive at this point in much less time than you think. Use this process of starting slowly and gradually working the tempo up little by little as you work through the patterns. Always use a metronome or backing track and play in sync rhythmically. Don’t let your playing be sloppy. Better to play slow and accurate than fast and full of mistakes. Once you’ve spent some time working on the preparatory exercises and patterns, spend some time improvising over one of the backing tracks using the pentatonic scale. The full version of the Pentatonic Patterns for Improvisation ebook includes an in depth explanation of the music theory you need to construct major and minor pentatonic scales in all 12 keys. There are over 60 patterns and 12 backing tracks like the one used in this video representing the 12 keys. You can use this book to develop technique on your instrument and begin improvising in all keys. 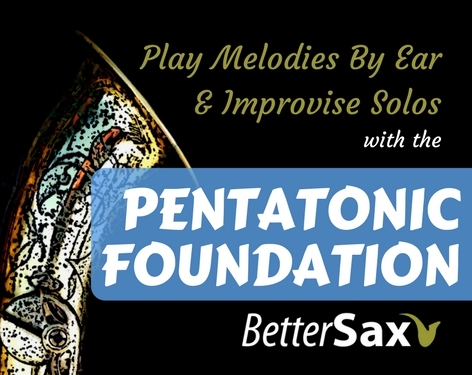 If you want to learn how to play popular song melodies by ear and improvise great solos, check out the Pentatonic Foundation video Course. Thankyou first off for making something like this thats available to all the sax players out there regardless of our level of skill. Just wondering if by chance you had a hard copy of your lessons that I could purchase. CD’s if possible and books would be amazing and I would pay more if it costs more. 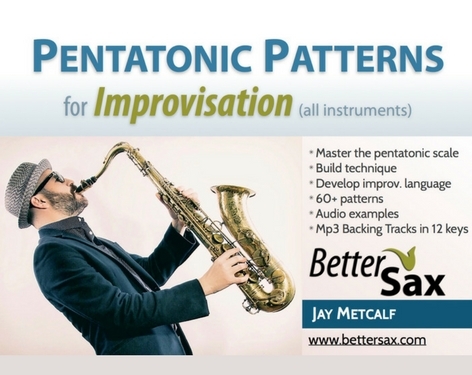 The Pentatonic Patterns for Improvisation book is only available in digital format at the moment. 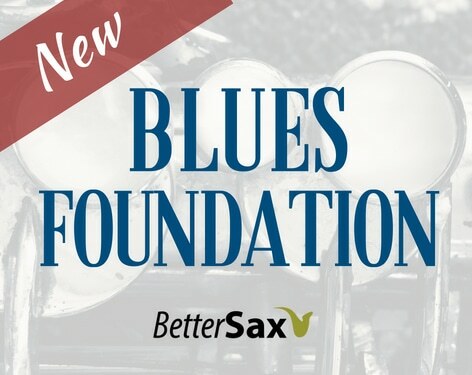 My Pentatonic Foundation and Blues Foundation Courses are available on DVD. I have been watching your YouTube channel for a while and am considering buying your courses. You see, I was playing a lot of Alto Sax when I was in High School and had top marks in both Concert and Jazz classes. I played in several bands as a teenager and learned to play pretty well by ear. For various reasons I decided not to pursue a career in music and turned down the prospect of attending Berklee on a scholarship. 30+ years later, I have decided to dust off my horn for real and see how good I can get. I love all kinds of music but gravitate towards R&B, Rock, Funk and various styles of Jazz. I really want to learn to improvise well. I have pretty good tone, can read music and am starting to learn to read chords. I have plenty of method books, scale books, play-alongs etc. 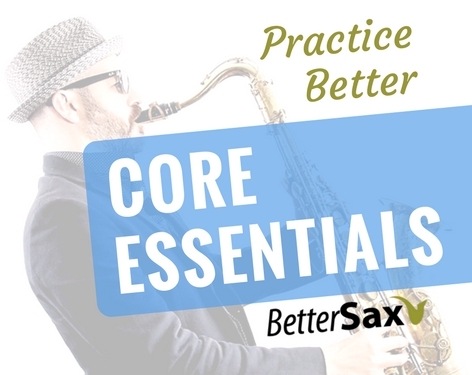 I realize I need to practice a number of different things but when it comes to scales and improvisation, I keep hearing is that one must master the major scales first. It is like every method out there seems to promote a very linear approach. In other words, dont tackle the minor scale until you know your major scale. Don’t tackle the pentatonic scale until you know your blues scale etc. Is it OK to be working on various different kinds of scales simultaneously, gradually getting better at them all or do you suggest a linear approach to scales? Good question. There isn’t one right answer as it depends on the individual. All harmony is based on the major scale more or less, so you want to understand that first before getting too far into the others. The modes of major are the most commonly used scales in all styles of western music as well. Once you know your major scale well in all keys, you can then branch out into all the other scales little by little. If you take on too much info at once, you’ll probably get overloaded and that slows down progress. You have to work on all the stuff broadly at once while focusing on one thing at a time if you know what I mean. Thanks Jay for the comment. Sounds like I need to master the major scales and all the modes before I get carried away with other things.